Clean, pure water is a cornerstone of good health. Your body is mostly water, so the ongoing intake of water is essential to your every function. It's common knowledge that most water sources are now polluted, b ut there is tremendous confusion a b out what kind of drinking water is the most health promoting, and what kind of home water treatment produces the best drinking water. Today, too many people are choosing soda instead of pure water as their primary beverage and the health of an entire culture is at risk. The num b er one source of calories in the U.S. comes from high fructose corn syrup primarily in the form of soda. Americans drink an average of one gallon of soda each week , and this excessive fructose consumption is a driving force behind obesity and chronic degenerative disease in this country. The most practical and economical strategy to combat obesity and chronic disease is to replace all sodas and other sweet beverages with pure water. The trouble is, most public water supplies are loaded with hazardous contaminants, such as disinfection byproducts , fluoride, and pharmaceutical drugs , to name just a few. Nevertheless, you DO need to make water your beverage of choice if you want to be healthy - but it should be purified water. But beyond water filtration, there's also the issue of pH - alkaline versus acidic water. There are quite a few astonishing health claims being made about alkaline water, but are they true? Most of them are not. I would like to go into details of my interview with Houston Tomasz on this topic. He's a ten-year veteran in the water filtration industry and this article expands on some of the items that we discuss in our interview. The segment is part of a much longer interview that we will air in future issues. Additionally, I have interviewed two other experts on this topic and they both agree that ionizers that produce alkaline water are not your best choice. When I posted a comment on my Face book page, announcing I was interviewing Houston , I asked for questions and the most popular question by far was whether or not to drink alkaline water. Many alkaline water enthusiasts are convinced its powers are unparalleled and will vehemently defend it. I am also certain that many will post vigorous objections to my position, and that is their choice. It is also my choice and responsibility to provide information on a system that many people are relying on to provide health benefits that I feel are unjustified. It is my impression that the scientific justification for these water systems is absent and these consumers have merely fallen under the spell of a skilled marketer who selectively misused pseudoscientific information, and twisted it around to scare them into buying their product. There are a plethora of testimonials and so-called scientific studies on the Internet claiming alkaline water will cure your every ill. Many consumers, struggling to make sense of the scientific jargon, eventually throw up their hands in frustration. In truth, there are very, very few legitimate scientific studies about the effects of alkaline water on human health. The reality is, most of the circulating information is distributed by clever marketers, with very little scientific validity to back up their claims. Complicating matters is the fact that most water ionizers and alkalizers are being marketed by multi-level marketing (MLM) companies with less than stellar ethics. They sell you a very expensive machine, for which you get a good discount if you sign up as a rep, and once you're part of the MLM, you can't very well change your mind about its benefits (especially if you're going to sell the units) - even if you realize that the alkaline water is no longer “working” for you. I have been personally approached many times and encouraged to sell these systems and there would have been large revenue streams had I chosen to do so, but I would never promote anything that I would never use personally, and I can assure you that I would never use alkaline water as a regular source of water. Please understand I have no ax to grind here, and I am not selling any competing products. The sole purpose of this report is as a public health message to warn people that alkaline water is not all it is hyped up to be. I have no doubts that many people do notice improvements in their health when they initially start drinking alkaline water, but I believe there are other reasons for this, and I am convinced that this is not a healthful strategy in the long run, so it is my strong recommendation to avoid alkaline water ionizers. Some people experience an initial “high” when they start drinking alkaline water. This can easily b e attributed to detoxification, and the fact that they are likely just becoming better hydrated. Detoxification is about the only benefit of this type of water, and this benefit is limited to very SHORT TERM USE (no more than a week or two). I will elaborate on what is known about alkaline water, but first you'll need a basic understanding of the properties of water and a few definitions. As I will review in a future interview with Houston , there are many reasons why you want to avoid drinking tap water, or as Daniel Vitalis, a raw water enthusiast, refers to it: “tap liquid.” He believes calling what flows from your unfiltered tap “water” is being overly generous, and I would have to agree.  Distilled water : Water that is boiled and evaporated away from its dissolved minerals, and then the vapor is condensed.  Bottled Water . This water is typically from a spring or has gone through reverse osmosis before it is bottled. However, some brands are simply bottled tap water that may or may not have gone through any additional filtering.  Ionized water or alkaline water : Water that has been separated into alkaline and acid fractions using electrolysis, which takes advantage of the naturally occurring electric charges found in the magnesium and calcium ions; in the drinking water industry, ionized water refers to alkaline water, which has a pH greater than 7.  Deionized or demineralized water : Water in which the mineral ions (salts such as sodium, calcium, iron, copper, chloride and bromide) have been removed by exposing it to electrically charged resins that attract and bind to the salts.  Hard and soft water : Hard water is any water containing an appreciable quantity of dissolved minerals; soft water is treated water in which the only cation (positively charged ion) is sodium. The concept of the acidity or alkalinity of your body - or of water - is based on the pH scale. So it's necessary to have a basic understanding of what pH is. PH is simply a measure of the concentration of hydrogen ions . In fact, the acronym “pH” is short for “potential of hydrogen.” The higher a liquid's pH, the fewer free hydrogen ions it has; the lower its pH, the more free hydrogen ions it has. One pH unit reflects a tenfold change in ion concentration - for example, there are ten times as many hydrogen ions available at a pH of 7 than at a pH of 8 [ii] . The pH scale goes from 0 to 14, and a pH of 7 is neutral. Natural water on our planet ranges in pH from 6.5 to 9.0, depending on surrounding soil and vegetation, seasonal variations and weather, and even time of day responses to sunlight. Human activities further influence the pH of our water, from the barrage of toxic industrial pollutants. “ Pollutants in water can cause it to have higher algal and plant growth, as a result of increased temperature or excess nutrients, causing pH levels to rise. 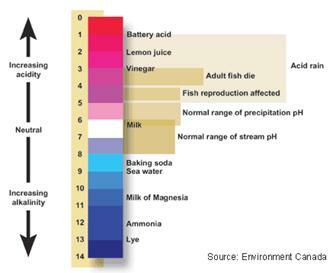 Although these small changes in pH are not likely to have a direct impact on aquatic life, they greatly influence the availability and solubility of all chemical forms in the lake and may aggravate nutrient problems. Most aquatic animals and plants have adapted to life in water with a very specific pH, and will die from even slight changes. A pH below 4 or above 10 will kill most fish, and very few animals can tolerate waters with a pH below 3 or above 11 [iv] . With living systems being so sensitive to changes in pH, it should comes as no surprise that YOU, as another living organism on this planet, would be sensitive to your water's pH as well. So, what are the recommendations for optimal drinking water pH? In this voluminous tome, you would expect to find everything you'd ever want to know about your drinking water, right? Well, everything EXCEPT a pH recommendation - there are no health- based guidelines for pH! It appears that the WHO is more concerned about the pipes in your house than the pipes in your body. Most likely the optimal pH of the water you were designed to drink is somewhere between 6.5 and 7.5. Although the research is clear that alkaline water has detrimental effects on plants and animals, there are not many studies with humans. A review of the literature turns up a variety of anecdotal evidence a b out the importance of ph to various living organisms, however, and as you might expect, optimal pH varies, depending on the organism. If you are a gardener, you can view a helpful illustration of the environmental effects of pH in your own garden. If your pH is low, your hydrangea produces pink flowers, but if your pH is high, you'll get blue flowers. But what about us bipeds? There has been a great deal of debate a b out battling cancer by making your body alkaline. This has become a focus of interest as cancer rates have skyrocketed (along with many other chronic, debilitating diseases), while our bodies have become more acidic from our processed-food diets. The scientific research about the benefits of alkalinity is by no means conclusive. There are some scientific studies that really argue against alkalinity , at least with respect to preventing or treating cancer. Consider the research by Robert Gilles, who has studied tumor formation and acidity . [xii] According to Gilles, tumors, by their very nature, make themselves acidic - even in an alkaline cellular structure. In other words, they make their own acidity. Talk about fighting fire with fire - they are fighting acid-loving cancer cells with acid! LESS alkalinity inside a cancer cell seems to be what you want, not more. So, all of those ionizer salesmen promising alkaline water will lower your cancer risk are completely clueless when it comes to what the scientific research actually shows. Even more interesting is a 2005 study by the National Cancer Institute , which revisits the use of vitamin C (ascorbic acid) to treat cancer. They found that, in pharmacologic doses administered intravenously, ascorbic acid successfully killed cancer cells without harming normal cells. [xiv] This is yet another example of cancer cells being vulnerable to acidity, as opposed to alkalinity . It's clear that the relationship between alkalinity and cancer has been grossly oversimplified by those jumping to premature conclusions - and of course by those trying to profit off your fear. The bottom line is that alkaline water isn't cancer's magic bullet. As is true with many things, in the end it's a matter of balance. Water that is too acidic or too alkaline can be detrimental to human health and lead to nutritional disequilibrium. This was demonstrated in a Swedish well water study[xv] , which found both pH extremes to be problematic. Your body simply was not designed to drink highly alkaline water all the time. So I believe it's best to be VERY careful when it comes to something as foundational as the water you drink on a daily basis. If you get it wrong, you could really cause yourself some major damage. It makes sense that you are designed to drink water that occurs naturally, which excludes alkaline water with pH levels of 8 and above. And if you drink alkaline water all the time, you're going to raise the alkalinity of your stomach, which will buffer your stomach's acidity and impair your ability to digest food as low stomach acid is one of the most common causes of ulcers. This can open the door for parasites in your small intestine, and your protein digestion may suffer. It also means you'll get less minerals and nutrients over time - in fact, some of these health effects can already b e seen in hard-core alkaline water drinkers. What you want is pure water - water that is clean, balanced, and healthful, neither too alkaline nor too acidic. Ideally, the pH of your water should be close to 7, which is neutral. Somewhere between 6 to 8 is likely fine. And some of the most healthful waters in the world - that emerging from mountain springs - are actually acidic in the range of 6.5. and would absolutely b my preference if it were readily available. If this is something that interests you there is a we b site, FindaSpring.com where you can find springs in your local area. One reason I am such an advocate for eating plenty of fresh, organic raw food is for its biophotons. Biophotons are the smallest units of light, which are stored in and used by all biological organisms - including you. Vital energy finds its way into your cells from the biodynamic foods you eat. In the same way that raw foods are alive with biophoton energy, natural water is “alive” in a similar way. If you really want to alkalinize your body it would seem wise to encourage it with the highest quality water possible which is obtained from vegetable juice. Green vegetable juices will help your body normalize your body's pH naturally. If this is new to you and you are interested in more information you can review my juicing manual for free. He demonstrated that water crystallization depends on the natural health of the water. He found that water from natural springs, healing water sources, etc., formed beautiful and complex crystalline geometries - like snowflakes. Water that had been distilled or polluted lost its inner order, and its ability to crystallize was profoundly disturbed. You wouldn't want to eat dead food... so why would you want to drink dead water? Water Ionizers are NOT Filters! It is really important to understand that the ionization process in no way, shape, or form purifies your water. Many of them have additional carbon- based filtration systems added, as reverse osmosis or distilled water will not allow the ionizer to produce alkaline water. If for whatever reason the information I am presenting here does not convince you to avoid using ionizers, then you will need to carefully analyze the water filter that is being used. This article only addresses ionizers and alkaline water. In the near future I will post a comprehensive review of water filters as it is complex issue that is beyond the scope of this article. Is Your Water Filter Certified? In order to ensure your water is pure, you should use a high quality water filter in your home and workplace. You can narrow down the choices by making sure the product you choose is certified by a reputable independent water certification agency. Two less rigorous certifications are Pace Analytical , and The Water Quality Association (WQA). There is no national regulation of water products - states have their own regulations, which vary greatly state by state. The EPA has published a chart listing their limits for every type of water contaminant, including microorganisms, disinfectants and disinfectant byproducts, organic and inorganic chemicals, and radionuclides, viewable here . The typical American diet is loaded with sugar and processed foods, which throws off your body's ability to optimize your pH. Although your body has mechanisms to buffer your pH, many of you are likely living in a state of low-grade acidosis from eating too many low-quality processed, devitalized food..
Our ancestors had no problems with pH because they ate a pre-agricultural hunter-gatherer diet, rich in plant foods and high quality meats, and devoid of grains . You can optimize your body's pH by eating like your ancestor's did - a diet rich in raw, organic, whole foods - and this will help your body achieve homeostasis. Remember, there is no one-size-fits-all nutrition plan that works for everyone, which is why Nutritional Typing is so helpful. Determining your nutritional type will help you narrow down the foods that are best for YOUR body's individual chemistry. A diet that makes one person “acidic” may make another person “alkaline,” so there is no one single universal food list for perfect pH. I want you to be aware of just how important it is to understand your body at a deeper level. Your body is a complex, multi-faceted biochemical system that is unlikely to respond well to shot-in-the-dark treatments, like alkaline water.  viii JGM Roelofs. “Inlet of alkaline river water into peaty lowlands: Effects on water quality and Stratiotes aloides L. stands” Aquatic Botany Volume 39, Issues 3-4, 1991, Pages 267-293.  ix TY Yesaki and GK Iwama. “Survival, acid-base regulation, ion regulation, and ammonia excretion in rainbow trout in highly alkaline hard water,” Dept. of Animal Science, University of British Colum b ia , Canada (March 5, 1992) JSTOR: Physiological Zoology , Vol. 65, No. 4, Jul-Aug 1992, pages 763-787.